This was the first time that I had a lot of these ingredients in gumbo and don’t know why I did not try some of them before today. 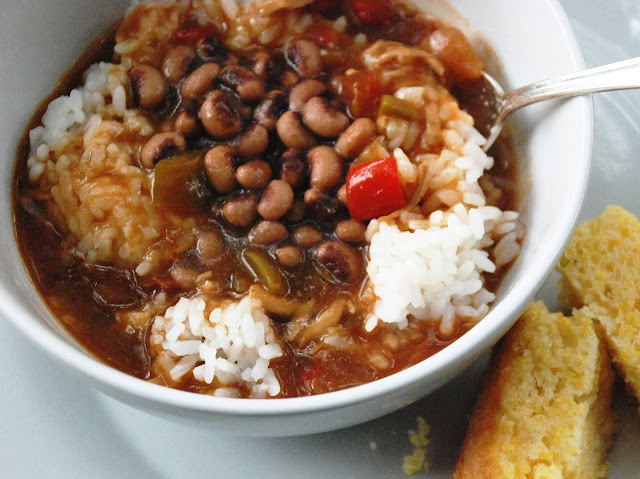 This recipe by Chef Link and co-owner Chef Stephen Stryjewski, embrace the finest New Orleans flavors and the combination of pork, blackeyed peas and greens simply cannot be surpassed. So why am I cooking Gumbo in May? It was 42 degrees this weekend here in Chicago. Congrats to Chef Stryjewski who won the Best Chef of the South at the 2011 James Beard Awards. In prep bowls, measure and chop all of the ingredients before you start cooking, It will make this recipe a lot easier to put together. Be patient when making the roux. Remember, practice makes perfect and bring it to a darker level than I did – almost black. I have a tendency of pulling it off the stove too soon. Make a dark roux using the oil and flour. Add the stock and stirring very frequently bring up to a simmer. Simmer for about 1hour stirring lots. Skim all of the fat that separates out. Taste the gumbo. It should not taste pasty and like the roux anymore. If it does you may need to add more stock up to ½ gallon. This is different every time depending on the exact measurement of flour, strength of starch in the flour, degree of cooking of the roux among other things so add the stock in stages and let it cook and come together before adding more. When the gumbo is the right consistency add the okra, blackeyed peas, greens, pork and seasoning. Allow to return to a simmer and adjust the seasoning. Serve with steamed rice or potato salad.